This weekend Bryan and I were able to continue our Pulp Alley race to find clues pointing to the secret of Perilous Island! 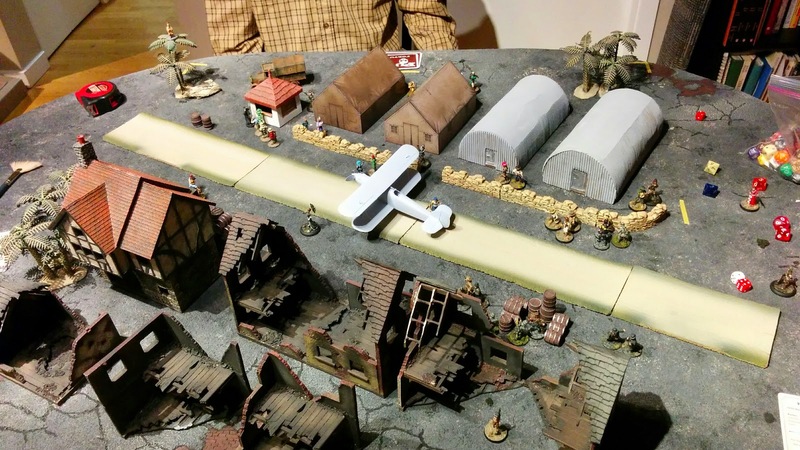 We had planned on playing the Last Flight Out Of Casablanca scenario, but when that one wrapped early, we forged ahead and set up a different table to do the Warehouse Throw-down scenario (not the actual names of the scenarios, but I don't have the book in front of me). Following on from our fight to get some answers from the famed archaeologist's daughter at a dig site in Mexico, we found ourselves at cross-purposes once again, this time at the airstrip in Casablanca. The Shadow and his sidekicks, Andre and Mr. Wu, were trying to secure the last tickets out of Casablanca and see the archaeologist's daughter safely on the plane. Black Sascha and the She-Wolves of the SS, meanwhile, were trying to find a mechanic who could sabotage the plane before it left. The scenario was further complicated by crowds of people and the presence of French gendarmes. The police would crack down on anyone using violence, so the scenario was designed to discourage direct fighting. An overview of the airstrip: Black Sascha deployed on the lower left corner, and The Shadow on the upper right. BS's first objective was among the barrels near her corner, and The Shadow's first objective is the ticket booth near his. The Daughter and the Mechanic only appear after the first Plot Point is found by their respective teams. 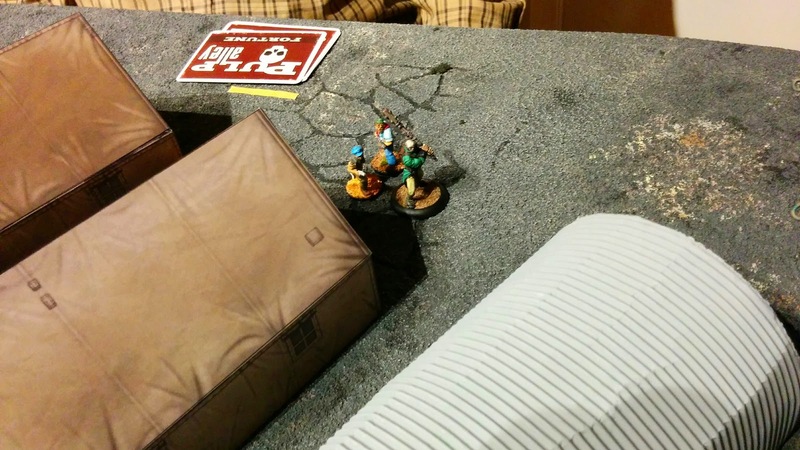 ...in the opposite corner, Black Sascha races past the objective, leaving it to her sidekick, Gertie. 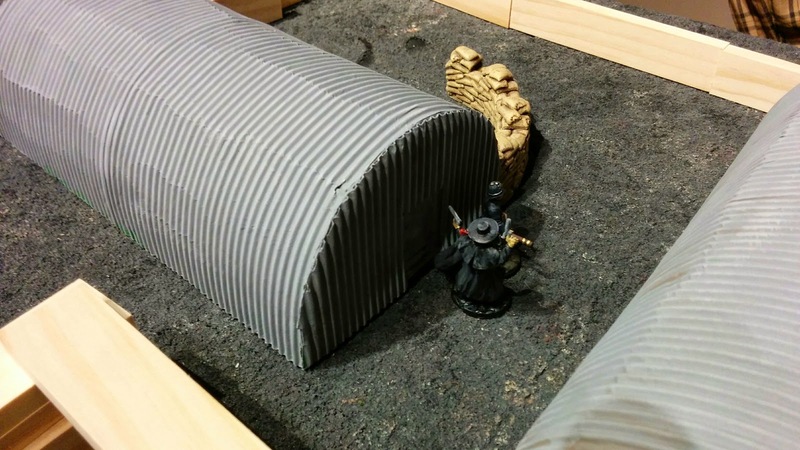 Andre and The Shadow's mooks sneak around behind some tents and quonset huts. With the first objective of each team quickly achieved, The Daughter (red dress, center left) and The Mechanic (brown shirt, giant wrench, center bottom) appear in the crowd. The covert battle is about to turn hot! On the left, Mr. Wu has approached The Daughter, only to be interrupted in his fierce whisperings by Black Sascha, who thunders down out of the sky on her experimental jetpack! The Shadow positions himself to interfere with everybody. Emma of the SS begins talking to The Mechanic. 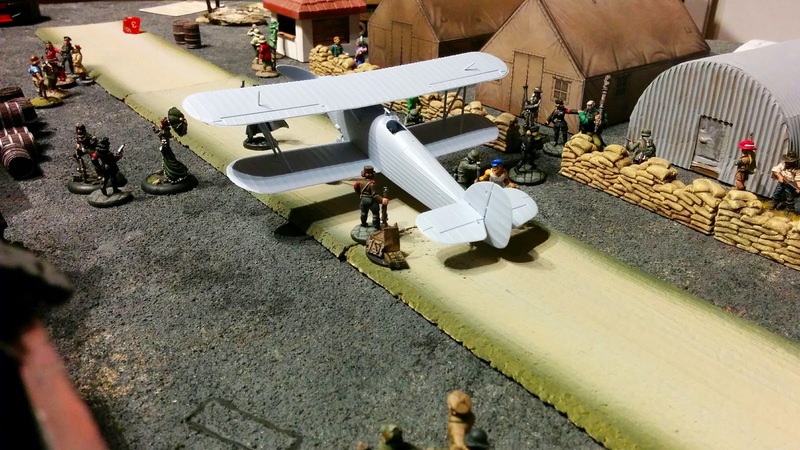 Gertie approaches the (very recently assembled and yet--unpainted) biplane. On the other side of the airstrip, the first shots are fired as some German troopers and She-Wolves open fire on Andre and the mooks. The photographer must have caught a stray bullet in the firefight, because the pictorial record apparently ends there. Witnesses on the scene report that Black Sascha spent precious minutes flogging the snot out of Mr. Wu, but it seems she mistakenly packed her late-night tingle-time whip instead of her fighting whip, because Mr. Wu just laughed off every attack and peril played on him. 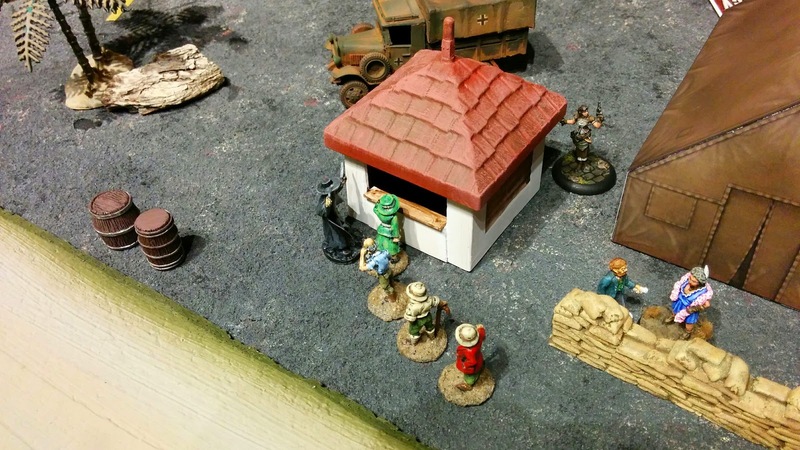 Andre and The Shadow's mooks fought a bloody, but mostly irrelevant, fight against on the other side of the airstrip. Emma got beaten up by The Shadow while trying to speak to the Mechanic. Gertie ran in and took her place, managing to "convince" the Mechanic to come along with her. While this was going on Mr. Wu ran past them and tried to get The Daughter onto the plane, but he was betrayed by an oil spill on the tarmac and fell to his ruin. 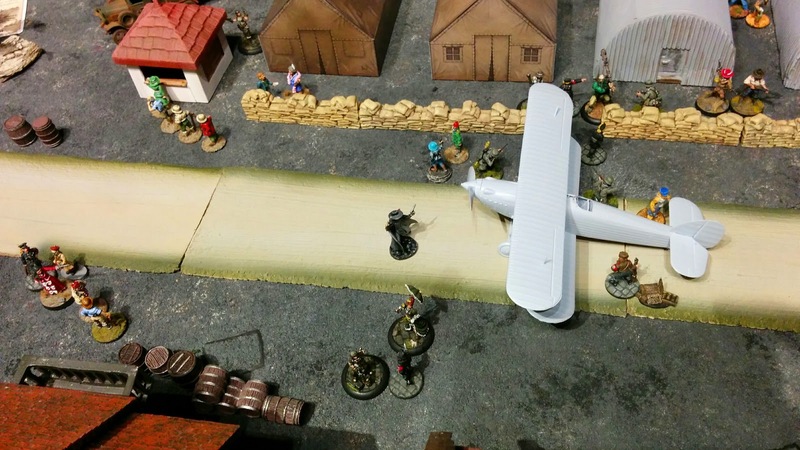 This allowed Gertie to return to the plane, with the first two objectives in tow, and get the Mechanic to wiggle the fuel line loose, bringing the scenario to an end. Casablanca was a fun scenario and felt quite different from the usual miniatures game, with the rules discouraging the two sides from fighting each other at all. My big coup in the game, flying BS over to try and steal The Daughter from Mr. Wu, was a bit of a damp squib, as nothing I did had any effect on him. My luck turned around in the last turn, though, as Gertie managed to salvage all three plot points and end the game. In every game I've had so far, Gertie has had a much greater effect on the game than my leader. Maybe a bit of a shake-up is in order? 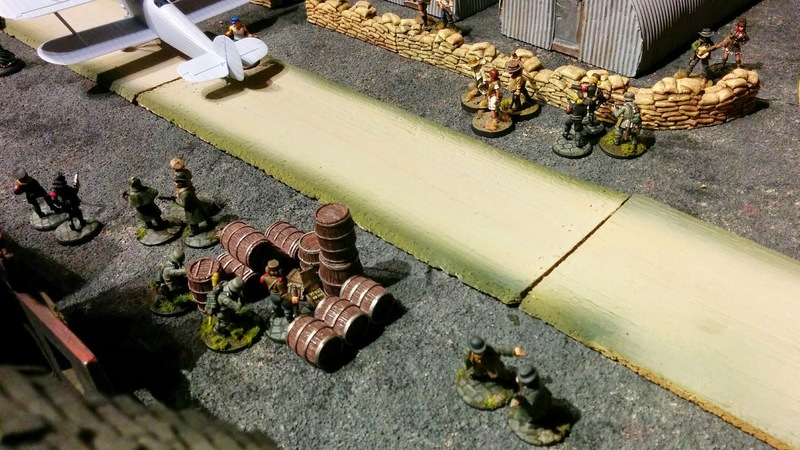 Following the events at the Casablanca Airport, the two teams found themselves embroiled once again, this time late at night in a vast customs warehouse in Athens. Because Casablanca ended so quickly, we had time to play this one immediately after. 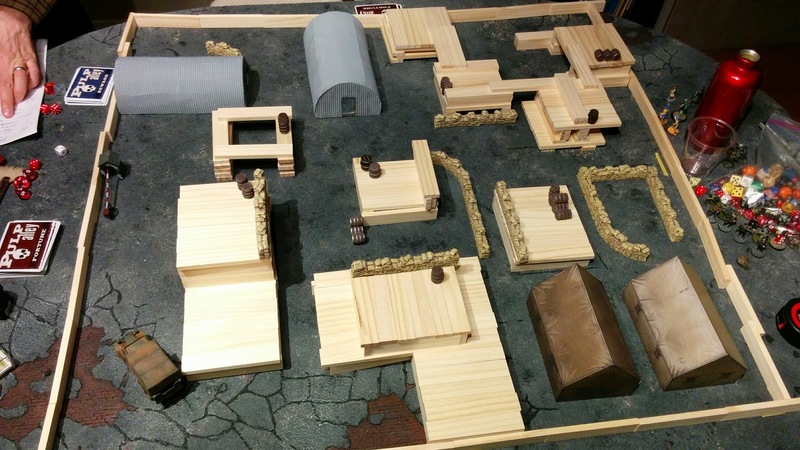 I don't have a 3x3 warehouse model, but we were able to put together something representative with some wooden blocks I won at Science World last halloween. 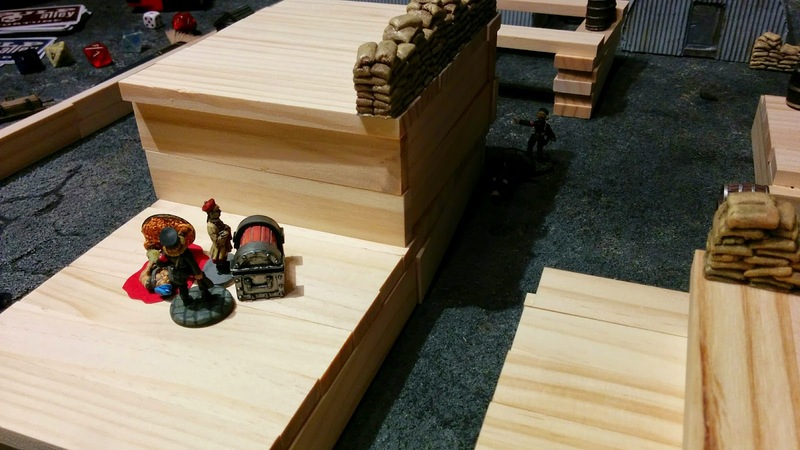 This time the plot points were two night guardsmen, a customs official, and a box of records. Once a character had one of these plot points in their possession, they could approach the center of the table and try to find the major plot point hidden somewhere near there. The layout before deploying any characters or setting out the plot points. There are entrances to the warehouse in the center of each of the four walls. 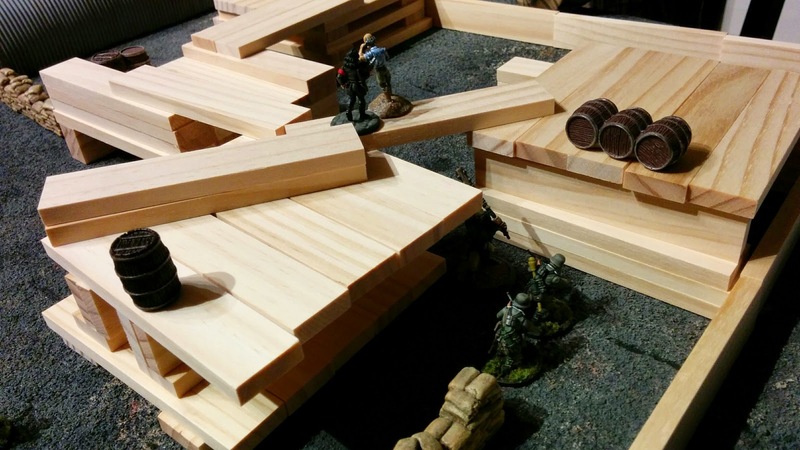 We treated anybody touching any of the obstacles as being in perilous terrain from falling boxes, and anyone on top of any of the obstacles as being in extremely perilous terrain. 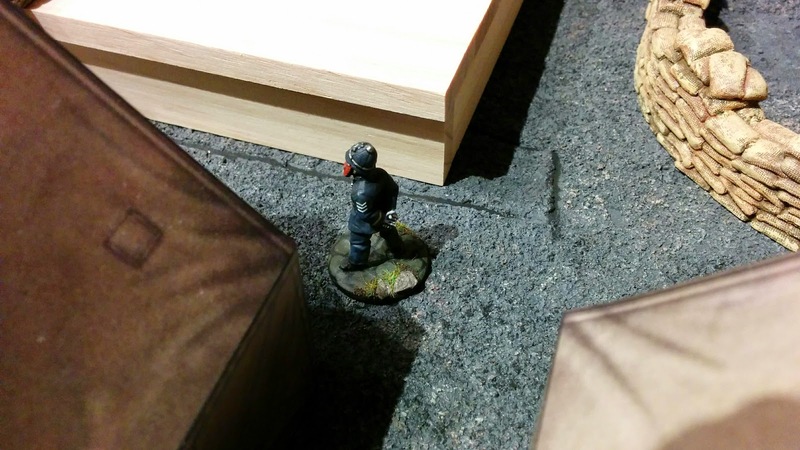 One of the guardsmen patrolling the warehouse, oblivious to the beefy female nazi danger his will shortly be facing. Nearby, the clueless and nearly-blind customs official walks across the teetering piles of packages, focused wholly on his paperwork (or maybe he's texting his girlfriend?). Mr. Wu and Black Sascha quickly come to blows over the package of customs paperwork nearest their respective corners. One of The Shadow's mooks tries to get involved, to his cost. Gertie and The Daughter (who, inexplicably, has decided to join the She-Wolves for the time being [because I won the last scenario]) approach the guardsman and begin beating some answers out of him. Emma, one of the she-wolves, climbs the stack of crates and tries to talk to the Customs Official. He apparently doesn't see her and bumps her elbow, causing her to lose balance and fall down. Spoiler alert: she never gets back up! Meanwhile, below, Andre approaches a pair of German soldiers, who manage to take out the giant Frenchman, but both perish in the doing. 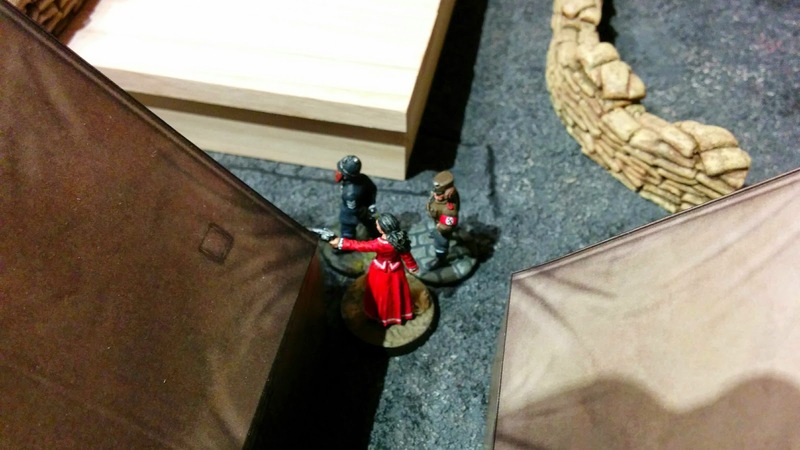 Due to a series of terrible rolls, The Shadow spends almost the whole scenario talking to the other night guardsman. 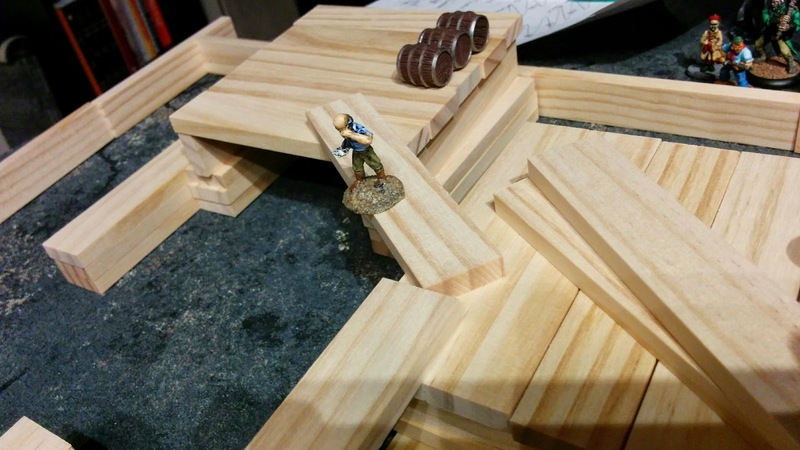 By the end of the game, he had only just made it back to the center of the table where the action was. We also figured he must have missed a turn at some point in there. The scenario came to a close at the mandated end of the sixth turn, but by that time it was (due to a misreading of the rules) impossible for either of us to take control of the final objective. We had thought that doing a plot point challenge was a full action, and therefore you couldn't move up to a plot point and do the challenge on the same turn. When we figured out that this was erroneous, we decided to play a seventh turn with the correct rules, and in that time Gertie (yes, Gertie again!) seized the opportunity and nabbed the major plot point. After Gertie succeeded at the challenge, I think Bryan realized that he could have sent The Shadow in there to do the same thing, but his brain was still operating according to our wrong-headed version of the rules. Again, another fun scenario with lots of action and drama. One thing we both really like about the campaign system is that the rewards and penalties to winning and losing scenarios are minor and temporary, only giving a very small advantage in the next scenario. This is in contrast to other systems like Mordheim, where one really big win or really bad loss can wreck the balance between the two warbands for the rest of the campaign. The next stop on our itinerary is the mean streets of Soerabaja, Indonesia, which may just happen to visually resemble a half-ruined Normandy village. I have other friends who are interested in trying the game, too, so there may be further complications on our road to Perilous Island in the future! Great reports! 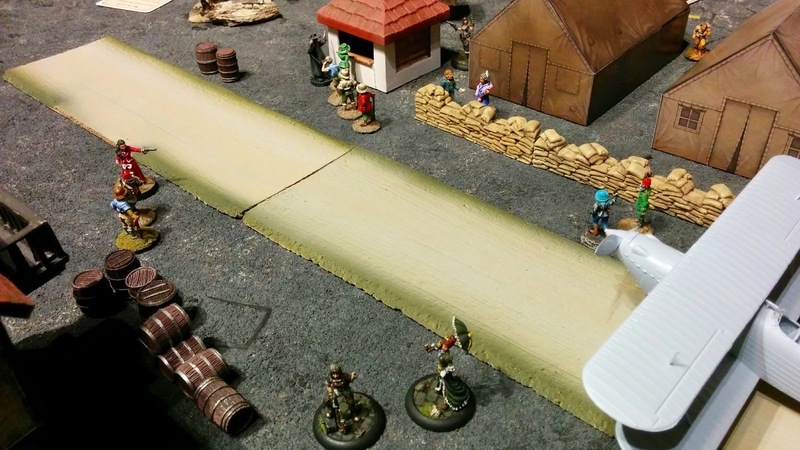 Really must have a game of Pulp Alley!! Look forward to the next installment! The Road To Perilous Island: Soerabaja!